"Nigunim are Hebrew melodies, secular or religious, fast or slow for instrumental music-making." 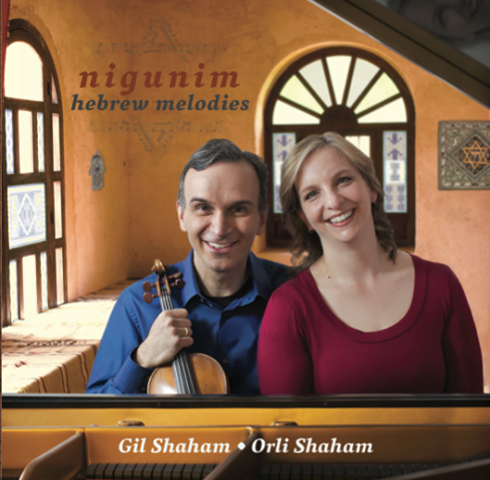 So begins helpfully the liner notes for Gil and Orli Shaham's album Nigunim (Canary Classics 10). Gil gives us his extraordinary violin playing, Orli her vivid piano foundation in this collection of duo showpieces. The violin-piano Jewish music-making tradition in terms of formal compositions goes back at least around 150 years, when special versions of traditional or current, even newly composed Hebrew song-form melodies began to find expression in a virtuoso manner. Gil and Orli have brought together some wonderful examples that span the 19th century through to today, compositions that combine the tonality and rhythmic vitality of the shtetl with the classical/classical-modern compositional touch. Wonderfully played, the pieces range from brief, single song arrangements like Joseph Achron's "Hebrew Melody, Op. 33" to longer suites like Ernst Bloch's "Baal Shem, Three Pictures of Chassidic Life," and the world premiere recording of Avner Dorman's Violin Sonata No. 3, which bears as sub-title "Nigunim". We get John William's "Three Piece Suite" from Schindler's List as well. And it is throughout very worthwhile music. All are played with the thrilling virtuoso sound so present and accounted for in Gil Shaham's violin performances. With the duo in synch as they are, so attuned to the Hebrew nuances of the music, this is a stunning, landmark disk! No more need be said, except if you love the Hebrew strain of melody-harmony, you know this music well or not at all, you should not pass on this one. Fabulous!